We’ve seen a serious series of super moons this summer and the show’s not over yet. Mark your calendars: the next one will light up on Tuesday, Sept. 9. While it may seem sunny and clear up on a super moon, a steady rain of space dust and particles is zipping in and striking the moon day in and day out. Undetectable from Earth, these tiny travelers are moving fast. “Most particles hit the ground at several kilometers per second or more,” explains Bruce Campbell, a geologist at the Smithsonian’s National Air and Space Museum. “A particle of dust moving at that speed will break a pretty good chunk off a rock.” This particle rain is the dominant erosive effect on the moon, part of an endless process of the rocks being broken down and the dust gradually building up. So what you see when you look at the moon is dust,15- to 60-feet-deep in places, built up over 4 billion years. Recently, however, Campbell and his colleagues have figured out a way to peek through that dust layer. Two new radar images published recently in the Journal of Geophysical Research show the moon’s true face, and it’s not a pretty picture. The moon’s pockmarked surface tells a violent tale of thousands of meteor and asteroid explosions, ancient lava flows and the passage of billions of years of deep time. Smithsonian Science asked Campbell about these latest images. Q: How does one take a radar picture of the moon? Campbell: Radar signals are beamed from a transmitter at the Arecibo Observatory in Puerto Rico, strike the moon, bounce back and are caught by receivers at the National Radio Astronomy Observatory in Green Bank, W.Va. We use radar with a long 70-centimeter wavelength that penetrates through the moon’s dust, sometimes reaching a hard surface below. By measuring minute differences in the time it takes for the radar waves to return, and their radio frequency, we can make an accurate image of the moon’s surface. This technique has been used to study many objects in our Solar System, including asteroids and other planets. Q: One of your new images is of the impact crater Aristillus. What does it show that can’t be seen in a telescope image? Campbell: We can see large boulders and fragmented rocks really close to the crater that have been thrown up and flipped over. They didn’t go very far – they were just lifted out of the hole as the meteorite exploded underground. Some of this material slumps back into the hole as the crater forms. Beyond that you can see a dark “halo” of pulverized debris that’s been thrown ballistically, catapulted out and traveling great distances. The radar exaggerates these subtle compositional changes and differences in rock abundance below the dust layer. We are also able to detect lava-like melt flows formed from the heat of the impact. Q: A second image shows the Mare Serenitatis (Sea of Tranquility), a feature of the moon that can be seen from earth. What did you find there? Campbell: Mare Serenitatis was carved out of the moon some 4 billion years ago by a massive asteroid impact. We don’t see impacts like that in our solar system anymore because asteroids of this enormous scale were pretty much depleted from the inner solar system about 3.5 billion years ago. 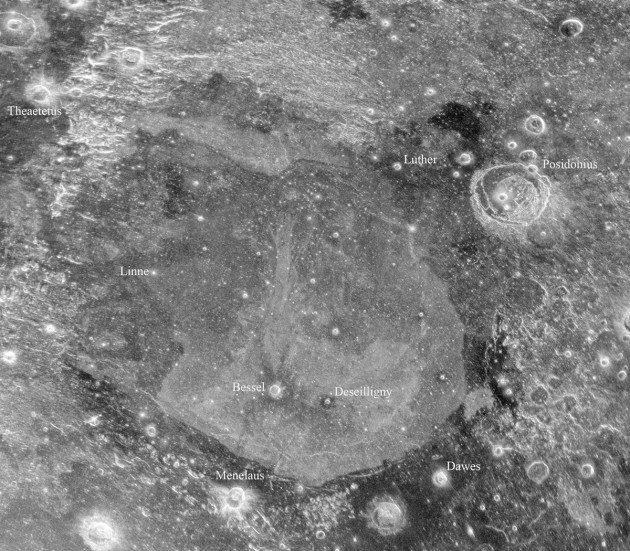 Still, the moon has several dozen large basins carved out by giant impacts like that. 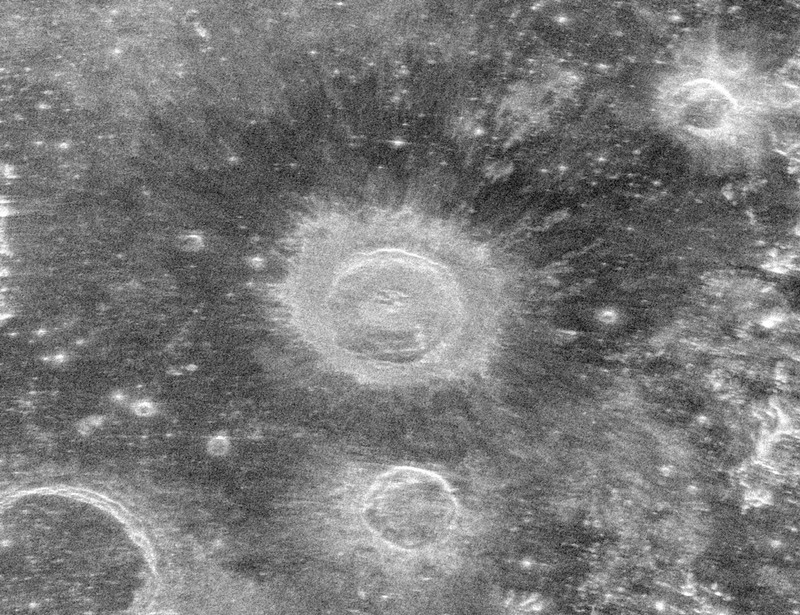 One big finding from our latest image of Mare Serenitatis is a kind of ghostly outline in the middle of the crater that defines two large fields of lava that formed at different times in the moon’s history. When the Mare Serenitatis crater was formed the moon was still warm enough for magma to come close to the surface, and hundreds or thousands of lava flows emerged in the crater’s bottom and began to fill it up. The lava would flow for a period of time, stop, and then another round of eruptions would occur.Over a billion years these layers stacked up between 2 and 3 kilometers deep. The radar exaggerates the differences in the mineral composition between these lava flows and we are able to see some of the later flows quite clearly. Q: Most of the moon’s craters are very circular in shape as if meteors and asteroids only strike its surface directly from above, and never from an angle. Why is that? Campbell: Meteorites and asteroids are moving so fast when they hit the moon that the time it takes for one to burrow deep into the moon’s surface (as deep as two or three miles) is actually less than the time it takes for the shockwave to pass through the object and break it up. A shockwave caused by the impact reaches the back of the meteorite after the meteorite is far underground and then it explodes. The meteorite is completely fragmented in the explosion, and most of it is distributed out over the crater. So, it is almost like you detonated something underground. This is why most of the moon’s craters look so circular; only a few meteorites arrive at a large enough angle to make an oblong crater.